The hierarchical arrangement of knowledge (and the related assignment of power and authority to roles expressed on organizational charts) did not foresee the arrival of social computing tools and the horizontal networking now shaping today’s workplace. « Knowledge is power », malady the saying goes. Setting aside issues such as what exactly knowledge is, and the many forms of manipulating information and knowledge in order to affect behaviour, voting outcomes, investment decisions and such, the foregoing phrase has been conventional wisdom ever since Sir Francis Bacon first noted « Scientia potentia est » (knowledge is power) in 1651. This realization and statement came into being a little more than 200 years after Johannes Gutenberg, upon having an idea visit him like « a ray of light », came up with the invention known as movable type, which subsequently took form in the Gutenberg printing press. The invention of the Gutenberg printing press is widely hailed as a critical turning point in the history of the world. It brought into being a new medium for creating, distributing and using information and knowledge. Due to its effects on how information and knowledge were recorded and published it created fundamental change in the way(s) people communicated ideas, information, knowledge and meaning to and amongst each other. Given the speed at which many things operate, unfold and evolve these days, we tend to forget that the massive changes in the distribution of information and knowledge afforded by the printing press took several hundred years to have really major impacts. But clearly books, magazine and pamphlets were the ‘radical transparency’ of that era where previously information and knowledge was jealously held, guarded and hoarded by and circulated amongst those who ruled over others. Those days are long over. Since then we’ve lived through two phases of a massive world-transforming Industrial Revolution and the first phase of what has been called the Information Age and/or the Knowledge Age. We now seem to be entering the second phase of the Information / Knowledge Age, in which we really get hooked up … in this phase interconnectedness and continuous flows of digitized (and thus indexable, searchable and easily manipulated) information characterizes the environment. Flows of power increasingly are both top-down and bottom-up. A new, fourth source of power beyond monarchs, clergy and institutions (the traditional sources throughout human history) is rapidly coming into being .. public opinion built from the circulation of information in networks (as depicted in the following info-graphic by Michel Cartier). This new set of conditions is also beginning to impose a powerful new sociology onto the core assumptions that defined the use of information and knowledge in the second phase of the Industrial Revolution, wherein F.W. Taylor’s notions of efficiency and effectiveness grew into widespread dominance and provided exactly the right logic for organizing and optimizing many aspects of western societies that were expanding and growing rapidly. Rapidly-growing knowledge about how to create and deliver many goods and services met equally rapidly expanding and growing needs. Mass production and mass assembly demanded mass and standardized efficiency in order to meet these needs. In addition, these conditions were met by the culmination of a remarkable spurt of innovation and development of scientific and management knowledge. Along came more modern inventions .. easy credit, mass over-consumption, financial engineering, advertising, marketing, national and international travel and greatly-speeded-up trade .. as key examples of the significant developments of the age. And most recently another transformational new medium or set of media signalling as much impact or more impact upon human society as delivered by the Gutenberg printing press. .. the Internet and then the Web. In the western world and large parts of the eastern world we now live and work amongst nearly ubiquitous hyperlinks, social networks, DIY publishing, ripping and re-mixing, content piracy, really radical transparency, and so on. Now, today, there’s a lot of chatter about the power of (people using) social media, the power of the kinds of possibilities that social media enables, bottom-up versus top-down dynamics, the collective wisdom of the organizational crowd, and various other related themes. One of the last places to begin feeling the impact of the digital hyper-linked environment has been the workplace. Yes, access to knowledge through education and training has brought about huge improvements in productivity over the past 75 or so years. The evolution of progress doesn’t stop .. whether it involves materials, designs or ways of doing things. And much of the progress of the past 75 years has come from deeply embedding the tenets of Taylorism – efficiency, predictability, replicable quality, stability and control – into the means of building and delivering good and services. Taylorism has been refined and then further refined, and then distilled into the essence of the ways things are. Today for most people it’s barely a conscious afterthought; it’s just the way things are done. It is the dominant and still-firmly-in-place paradigm. However, there’s ongoing dissonance between the Taylorism-derived methods .. the ones behind structured, highly-defined organizational activities forms .. and the growing demands imposed by the world of hyper-linked flows in which knowledge and meaning are built layer by layer, exchange by exchange, resulting in the « scaffolding’ of knowledge to feed continuous improvement and innovation . These are the results which, increasingly, networked social computing enable. A key reason why turbulence and dissonance are created is the way knowledge work has been (and still is) designed and the organizational structure that contains this work. A primary tool in designing work and its organizational structures is called job evaluation (which is often accompanied by derivatives like accountability mapping and redundancy analysis). The methods used today were created in the mid-1950?s and haven’t changed much since then. Their core assumptions are directly derived from, and have helped embed, Taylorism at the core of the modern organization. The term job evaluation as used here does not mean assessing a person’s performance on the job – rather, it means the function carried out by HR departments (or consultants) that ‘measures’ or ‘weighs’ jobs, and assigns them to levels and pay grades based on job “weight” with respect to skill, effort, responsibility and working conditions (the legal criteria for assessing pay equity). Taylorism-derived job analysis, evaluation and measurement are the tools (along with their underlying assumptions) that are used to create the skeletal architecture of hierarchical organizations, the pyramid we all know. The methodology of job evaluation is a very useful place to look at some of the key critical reasons for the ongoing dissonance and resistance to change we are seeing and will continue to experience. The methodology of job evaluation situates jobs in the organizational hierarchy and creates pay grades, pay practices, thresholds for entry into bonus schemes and often is the main criterion for distinguishing between management and non-management jobs. Fundamentally, job evaluation (work measurement, as noted above) relies on the core assumption that knowledge is structured and used hierarchically. Thus the job requiring more cumulative and/or or seniority-based knowledge (and the job requirements that demonstrate this) is—on paper—the job that deserves to be “higher up” in the organization, and accordingly is placed there on the organizational chart. There are four or five major, well-known methodologies for measuring work. They all use very similar factors (sometimes described a bit differently semantically, with a couple more or less factors or sub-factors) and they all essentially measure the same thing. These fundamental principles of work design need to be examined and re-conceived if the significant power of social computing is ever to be realized. As an example I will use the measurement factors used by the Hay Guide Chart Method, as I know them the best. I have also worked with the other major methodologies – they are essentially all the same: the Aiken Plan, and the Towers Perrin and Watson Wyatt job evaluation methodologies (now Towers Watson) in the past. 1. Know-how (input) – knowledge and skills acquired through education and experience. 2. Problem-solving (throughput) – the application of the said knowledge to problems encountered in the process of doing the work. 3. Accountability (output)- the level and type of responsibility a given job has for coordinating, managing or otherwise having impact on an organization’s objectives. There is a fourth factor called working conditions, but in many cases this is treated almost as a throwaway factor, especially when it comes to knowledge work. It typically relates to physical factors such as lighting, air-conditioning, the presence of fumes or chemicals, outdoor exposure, dangerous physical conditions, unusual exogenous stress, etc. As noted above, the core assumptions of these methods are derived from the philosophy of Taylorism (aka scientific management) and the divisions of labour and packaging of tasks that have underpinned the search for efficiency and scale ever since the beginning of the 20th century. On the face of it, they seem eminently reasonable and the Hay Method (and the related ones cited above) have since the mid-50?s largely served organizations quite well for segmenting and dividing labour, identifying necessary expertise and specialization and, in effect, designing one or another particular hierarchical pyramid. Today these methods are put into practice along with other key assumptions from that industrial era when organizations grew and prospered – mid–50?s to approximately 2000. These methods set out a fundamental, foundational assumption about the nature of knowledge. They assume that knowledge and its acquisition, development and use is relatively quite stable, that it evolves quite slowly and carefully and that knowledge is based on an official, accepted taxonomy – a vertical arrangement of information and skills that are derived from the official institutions of our society (Jane Jacobs has a fair bit to say about this in her last book Dark Age Ahead (Chapter 3 titled Credentialing vs. Educating)) as do others like John Taylor Gatto and Alfie Kohn, and as does David Weinberger’s Everything Is Miscellaneous – the power of digital disorder). Above I have offered an example (paraphrasing the Hay Guide Chart Method’s semantic scales for measuring a job’s knowledge). It describes a vertical arrangement of Know-How (knowledge) and the method creates, supports and sustains vertical reporting relationships. The other two factors (problem-solving and accountability) derive from, and reinforce, the know-how factor. For example, the rules of job evaluation are such that you cannot have a problem-solving or accountability factor assessment that is of a higher order than the know-how slotting. The definitions of the know-how (knowledge and skills ) factor levels are paraphrased from the semantic definitions on the actual Hay Guide Chart. These methods did not envision or foresee the Web, hyperlinks and the exchanges of information which have spawned and carry the bit-by-bit layering and assembly of knowledge and peer-to-peer negotiation of results and responsibilities we are seeing emerge with greater frequency in this new networked world. We are beginning to understand that the main way we have structured knowledge is only one way, and that this way is captive to core assumptions about the ordering and classification of information as created by some of the great thinkers, organizers and classifiers of information and knowledge who helped build up our growing understanding of the world around us (Linnaeus, Darwin, Dewey, etc.). What we have developed into solid and maybe seemingly unassailable beliefs about knowledge are built upon the principles we have inherited from a time when human progress benefited greatly from regular and related discoveries about the world around us, both natural and man-made. For example, it’s clear that there was a proliferation of written / printed material from the 1600’s through the 1900’s, containing amongst other things much codification of discoveries of the knowledge we use today in a wide range of domains and disciplines. More and more (too much ?) of this knowledge is accessible very rapidly on today’s Web in ‘fragments of one’ (nod to Dave Snowden’s assertion that the brain works most effectively with fragments of information) connected by search engines, hyperlinks and a range of easily used publishing platforms. So … now let’s look at how information is shared and exchanged in order to build and use knowledge amongst networked individuals or groups. 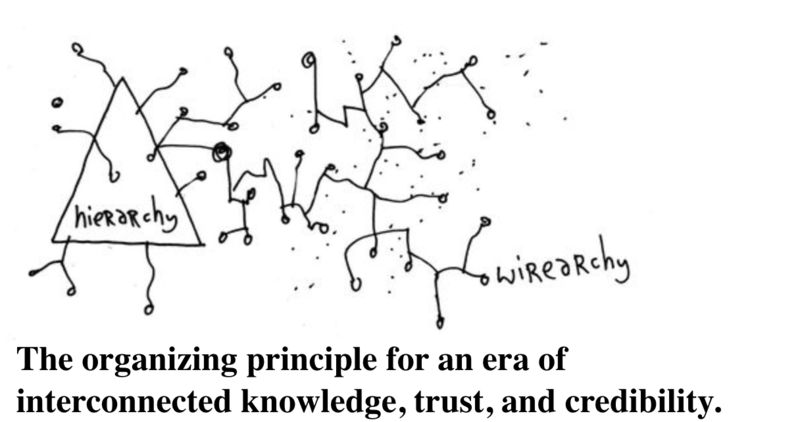 The use of knowledge in a networked context is very often much more horizontal, sideways and based on accessibility and collaboration – much more so than is the (official) use of knowledge in formally structured hierarchies. What we know today is that people with vastly different types and forms of knowledge can be or are linked together for a wide (and potentially limitless) range of purposes (though clearly we are learning quickly about the limits to cognitive attention as lessons in social cognition surplus are offered up to us almost every day). In networks-of-purpose, addressing Purpose A connects individuals with Skills and Knowledge Set B, Interests and Knowledge Set C , and Connections and Knowledge Set D (and of course the second-order concentric ring of connections each of them brings to any given network in which any of them participate). Each of them subscribes to different sets of feeds and has access to different sources of flows of information than each of the others, but can forward to all those in the on-purpose network anything that comes across their attention that may be pertinent to the purpose at hand. The dynamics of attention, flow and circulation of pertinent and relevant information are now clearly feeling the impact of the power unleashed by the integration of social computing tools, service and capabilities. They are rapidly becoming firmly ensconced in the activities of knowledge work, in the guise of platforms for collaboration—the domain increasingly called Enterprise 2.0 and/or Social Business. And, as many of us know, these monikers are increasingly being called into question as insufficient or only addressing part of the overall story. As the use of these tools and capabilities spreads, in a networked environment it’s safe to say that problem-solving or accountability is very often dealt with based on negotiation of ‘who knows what’ or ‘how to get something done’. Usually, or often, a call (Tweet, blog post, Skype chat, email) is put out to find and access some additional skill or knowledge that is required, and accountability is negotiated based on the constraints of the purposeful activity at hand. Any of us familiar with medium to large sized organizations can begin to see, I believe, that the fundamental Taylorist assumption that knowledge is structured vertically and put to use in silo’d pyramidal structures and cascaded down to the execution level must be straining at the seams in the increasingly highly-connected social networks in which many people work today. Social computing – first dissonance, then participative flow ? Thus, it seems clear that the introduction of wikis, blogs and RSS feeds (and now micro-blogging a la Twitter) for project work, for analysis and planning, for research and development and for other knowledge-intensive work is likely to introduce some reasonable levels of dissonance into the common and accepted organizational dynamics (or “organizational sociology”) of formal, traditionally structured organizations. This is an area where David Weinberger’s phrase from the Cluetrain Manifesto — “hyperlinks subvert hierarchy” (or expose it, which may be better)—is likely to have real impact. Take Weinberger’s additional concept of first- , second- , and third-order organization of emergent knowledge (outlined in his “Everything Is Miscellaneous”), combine it with hyperlinks and spaces designed for interaction based on core usability principles and you have a potent recipe for looking at the design of socially-networked work groups. In some senses, we’ve been here before … social interaction with other knowledge workers is the foundation of (for example) Fred & Merrilyn Emery’s theory and method of Participative Work Design and is at the heart of socio-technical systems (STS) methodologies for organizational development and change. These theories and methods by and large reflect “getting the whole system into the room”. Of course, with the arrival of the Internet and the advent of the interactive participative environment that is generally called Web 2.0, “the room” is larger and “the whole system” increasingly does indeed mean everyone, or at least the whole of the organizational crowd that makes up that organization. Reams have been written about the Internet’s potential to democratize the access to and use of information. It does seem clear that the use of the Web, collaboration platforms, software-as-a-service, and cloud-based social computing by organizations that see information, knowledge and responsive innovation as mission-critical are core factors enabling the growth of network-based ways of creating pertinent and useful just-in-time knowledge and putting it to work. As more and more knowledge work is carried out by people communicating and exchanging information using hyperlinks in social networks (where knowledge lives ) and routing it to where it is needed at any point in time, vertical arrangements of knowledge are disrupted, if not subverted. Based on the notions explored above and in a wide range of texts about organizations previous writings, it seems there is a rapidly-growing need for the return to prominence of the domain of Organizational Development (OD). With greater fanfare and less emphasis on the core principles, key parts of the framework known as organizational development have been resuscitated, dressed up and called « Social Business ». As social business initiatives continue to proliferate, I cannot see how the latent dissonance described earlier in this essay will be avoided. The turbulence and discipline that characterizes the power shifts going on in today’s interconnected knowledge workplace will have to be addressed by using new design principles for knowledge work. Many parts of knowledge work have been routinized and standardized with the ongoing marriages of business processes and integrated enterprise information systems. What has not changed much yet is the adaptation of structures and culture to permit easily building flows of information into pertinent, useful and just-in-time knowledge, or fanning out problem-solving and accountability into networks of connected workers. I think many executives and senior managers sense massive challenges to the power and status relationships (the core of yet-to-change organizational structure) that exist in most of today’s larger organizations. This sense of a growing challenge is behind many senior managers’ and executives’ struggles to understand or become enthusiastic about the possibilities of Enterprise 2.0. There is no Guide Chart yet about networked know-how, problem-solving or accountability. Never mind that there is much rhetoric about the need for leadership at all levels, or about the empowerment and democratization of workers in organization X or Y. Performance management, grade levels and compensation have yet to recognize how work gets done in networked environments and in a networked world. I’ll close with a dare .. if any of you have any experience with performance management programs or with assigning someone currently in a job to a new and different grade level, or in making changes to levels of pay or bonus schemes, you know what I’ve been setting out above can easily become a real and potentially very explosive minefield. And yet .. the way(s) we go about these core issues of work design are almost certainly going to have to undergo significant revision if not complete re-invention. Bill, same here. I am not sure what’s up with this WP installation.